Flower: calyx lobes unequal in width, reduced to 2--4 from fusion below middle, notched at tip; corolla 8--16 mm, yellow or orange, tube 20-veined near base, limb 2--10 mm diam. Fruit: 2.5--4 mm, gray, dull, cobblestone-like or round-tubercled, ridged or not. Chromosomes: 2n=24. Flower: calyx generally +- white hairy; corolla 8--12 mm, limb 2--6 mm diam, yellow; anthers appressed to stigma. Unabridged Note: Abundant most years forming dense colonies in DMoj. 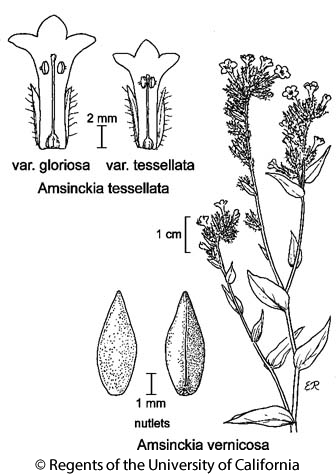 The problematic occurrence of the distinctive Amsinckia tessellata var. elegans in the Carrizo Plain and western Antelope Valley (western DMoj) areas may represent a hybrid entity +- combining the traits of both listed varieties. See Hoover (1970), see Vascular Plants SLO Co. for description and alternative viewpoint. Citation for this treatment: Ronald B. Kelley & Fred R. Ganders 2012, Amsinckia tessellata var. tessellata, in Jepson Flora Project (eds.) Jepson eFlora, http://ucjeps.berkeley.edu/eflora/eflora_display.php?tid=77020, accessed on April 19, 2019.
s SNF, Teh, SnJV, SnFrB, SCoR, TR (n slope), GB, D; Markers link to CCH specimen records. Yellow markers indicate records that may provide evidence for eFlora range revision or may have georeferencing or identification issues. Purple markers indicate specimens collected from a garden, greenhouse, or other non-wild location.